Marie's favorite stiletto is in reality a surgical tool. 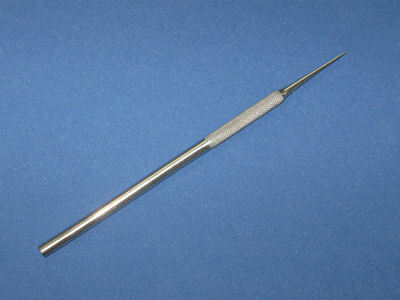 It's not only very strong but also very pointy and long enough to make it easy to use in a tight spot. Marie swears that she could never do perfect 1/4" seams when piecing quilt blocks or doing heirloom sewing before she started using this tool. Now, her seams are perfect from beginning to end without having to sweat over her machine. 6 " long surgical . This tool is used as a stiletto to guide fabric, decorative trim, lace and ribbon under the presser foot of your machine and get straight and perfect seams everytime. 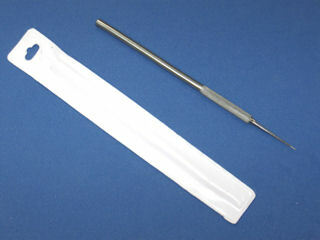 The stiletto/pick comes in a protective PVC sleeve.